Brace yourselves. Look, I know Stop 1 wound you up. You just got done with a reasonably delicious lunch, you’ve caught a glimpse of the volcano and loved it, and now you’re all about getting up close and personal with Mount St. Helens. But you need to take a deep breath and have a bit of Zen. What you’re about to see might tip you over the edge, and from this viewpoint, it’s kind of a long way down. So very much to see here. This overlook gives you an outstanding overview of the results of the May 18th, 1980 eruption, and some of the recovery since. Mount St Helens from Castle Lake Viewpoint. You will definitely want to click to embiggen this. First, the destruction: the first thing that will strike anyone who’s traveled the western side of the Cascades is the distinct lack of forest. Granted, a few trees are sprouting up like a teenager’s attempt at a first beard, but there’s an overall absence of treeness. It turns out that volcanic eruptions, especially lateral blasts, are not kind to trees. If you look to your right at the near ridge, you’ll see the remains of some of the former forest. For details on what happened to it, see the posts here, here and here. Panning left, you’ll notice a little sapphire gem of a lake set in a bowl-shaped valley. This is Castle Lake, and it just turned 33 last May. The gargantuan landslide triggered by an earthquake at 8:32 am on May 18th poured into the North Fork Toutle River valley as a massive debris avalanche. Over the course of ten minutes, that churning mass of ice, rock, dirt, and everything in its path roared 14 miles (22.5 kilometers) down-valley, filling it to an average depth of 150 feet (46 meters); in the most piled-up parts, it reached up to 600 feet (183 meters). Marginal levees from the avalanche piled up along the valley walls and choked off tributary valleys. Castle Lake backed up behind one such levee. Lakes like that can be dangerous: their debris dams could fail catastrophically, sending a flood roaring down the North Fork Toutle River valley toward populated areas downstream. In an attempt to prevent Castle Lake from breaching its levee, the US Army Corps of Engineers dug an outlet that keeps the water at a safe level, and drilled wells into the debris avalanche deposit to watch for changes that could alert them if the dam could become unstable. Continue panning left. In the center of the valley, you’ll see the North Fork Toutle River threading its way through the bumpy terrain of the debris avalanche. Those of you who know your river geomorphology will be able to pick out some of the terrace the river’s left as it’s meandered across the valley and cut down through the deposit. Nice of it to show us all the lovely layers! In some places, you can see not only the interior of the debris avalanche, but also lahar and fluvial (river) deposits.The north bank of the river is rather prone to landslides in many places; between a high water table and the movement of groundwater through the avalanche deposit, it’s very easy for that bank to collapse. Looking upriver, contemplate this: as of 8:42 am on cataclysm day, the upper North Fork Toutle River didn’t exist. It had been entombed beneath .67 cubic miles (2.79 km³) of collapsed volcano. Imagine an entire river being decapitated in the space of ten minutes! At first, after the debris avalanche came to rest, all the valley contained was the lumpy surface of the landslide. But it didn’t take long for the river to begin rebuilding itself. The first section of its new channel was cut when ice melting in the debris avalanche formed the North Fork lahar that same afternoon. Phreatic (steam) explosions caused by the blazing-hot chunks of cryptodome heating the buried streams and river until they flashed to steam left a line of depressions, most 16-330 feet (5-100m) in diameter and 3-66 feet (1-20m) deep. Other hollows formed by the settling and subsidence of the debris. This being the Pacific Northwest, it didn’t take long for many of those depressions to fill up with water. And when they were full to the brim, water spilled over and carved another section of channel. All through summer and into the fall, the channel grew from this fill-n-spill, plus some volumes of water released from larger lakes, including Castle Lake, by concerned engineers. Flowing water began behaving like a stream, widening its nascent channel, abandoning some portions in order to carve new. And then Carbonate Lake, born on May 18th, overtopped and breached its debris dam on November 7th, releasing a huge surge of water that sliced through a string of depressions. Almost two miles (3 km) later, a through-flowing channel had finally been completed. The upper North Fork Toutle River was reborn. Not all depressions hooked up to become the river. Ponds still dot the debris avalanche. You can see a little blue gem of one gleaming just to the left of the river, there. 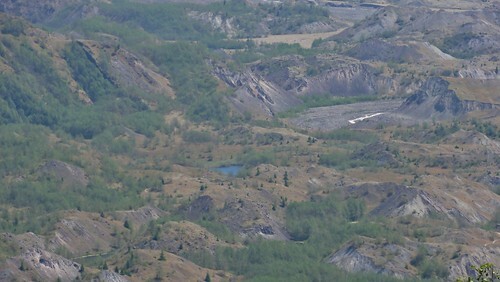 A small pond in the hummocky terrain of the debris avalanche deposit. When you lift your eyes from the valley, you’ll notice the scene is dominated by Mount St. Helens. And you might expect me to discuss all of the exciting features left by the lateral blast, like that ginormous breach. And what’s up with that rather smooth ramp emerging therefrom? Why, if the the volcano isn’t currently erupting, is the snow on it so ashy? 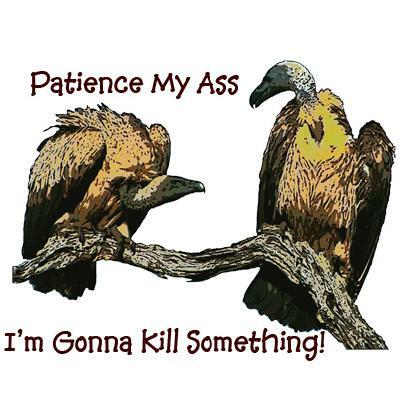 Patience, my dear geoadventurers! We shall come to that shortly. But first, let’s pay an up-close visit to one of the lakes born on May 18th. Evarts, Russell C and Ashley, Roger P. (1992): Preliminary Geologic Map of the Elk Mountain Quadrangle, Cowlitz County, Washington. USGS Open-File Report 92-362. Simon, Andrew (1999): Channel and Drainage-Basin Response of the Toutle River System in the Aftermath of the 1980 Eruption of Mount St. Helens, Washington. USGS Open-File Report 96-633. Beautiful. Barren and harsh, but beautiful. Fascinating. Glad you are back in form. I needed some good geology after the train wreck of yesterday’s election. At least this catastrophe wasn’t caused by greed, corruption, fear-mongering, and lies.